04 October 2017: Presented for a noble cause, the newly launched Piaggio Vespa RED 125 scooter is an exclusive edition from the praised Italian two-wheeler manufacturer in collaboration with RED, which is a recognized NGO spreading awareness for AIDS. The scooter stands tall as the top model in its species and features a complete red treatment from its glossy red paint job to the red seats and plastic panels. Complimenting the glossy red paint job is the highlighted chrome accents that add an appealing classy charm to the scooter. The mill that generates power in the Vespa RED scooter is the 125cc single-cylinder air-cooled engine churning 10.06PS @ 7500 rpm worth of maximum power and a torque of 10.6Nm @ 6000 rpm. The Vespa RED 125 has a claimed mileage of 60kmpl. The scooter flaunts its identity confidently with the eminent Vespa RED chrome badging on the top left side of the front apron and the centre-placed Piaggio logo. Offering a decent braking experience is the front and rear drum brake assembly sitting on the Monocoque Steel High Rigidity Structure. The classic RED scooter is priced at Rs 1.11 Lakh (On road, Delhi) and is expected to stand abreast its competitors including – Suzuki Access 125, Honda Activa 125 and Aprilia SR 150. Vespa RED 125 STD gives a mileage of 45 Kmpl as claimed by the Automotive Research Association of India (ARAI). Piaggio India has launched the Vespa RED in the country for a noble cause. The Italian manufacturer has partnered with RED, which happens to be an NGO responsible for spreading awareness for AIDS. Each Vespa RED scooter that will be sold in India will churn out a donation of USD 50 or Rs 3275 towards Global fund to fight AIDS in India. This will help offer more than 165 days of medication to a mother having AIDS and prevent spreading it to her unborn baby. The design of this scooter is based on the Vespa LX 125 and comes with the same curvaceous language. Add to that the glossy red paint scheme that makes it look stand apart from the rest.The Vespa RED is powered by a 125cc, single cylinder engine mated to a CVT gearbox. The engine churns out respective power and torque figures of 10.1bhp and 10.6 Nm. The braking to the scooter is done with the help of a 150mm drum brake upfront that pairs with a 140mm drum unit at the rear. The suspension system comprises of Aircraft derived single side arm with ant-dive characteristics at the front along with Dual-effect hydraulic shock absorber for the rear. The scooter receives 10-inch satin finished alloy wheels that enhance the look and appeal. 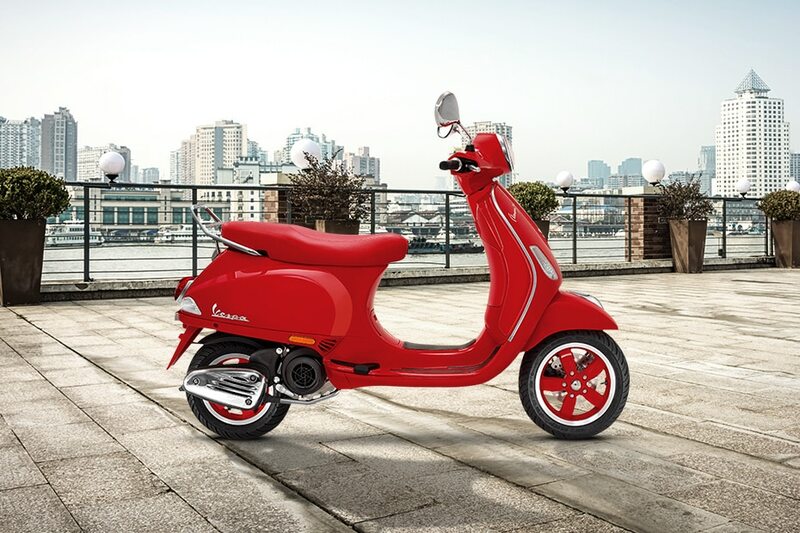 The Piaggio Vespa RED takes its design inspiration from the Vespa LX 125. The front section gets a rounded headlamp that lends a retro touch. The overall body has been drenched in red glossy colour, taking the visuals to a whole new level. The side profile of the Vespa RED is very curvaceous and can be seen as the prime style design highlight of this scooter. The seat is also in red colour and well matches the overall styling. A significant amount of chrome is also used in the scooter that finds its place at the rounded rear view mirrors, rear body grab rail, headlight casing, wheels and the exhaust muffler. The overall design philosophy shouts out retro theme and elegance no matter what angle you take to have a look at this scooter.The instrument cluster also, comes as a full analog unit and has a retro charm attached to it. The scooter also gets a pass by switch to ease up the task for the rider while overtaking. The Vespa RED comes fitted with a fuel tank having 7-litre capacity and has a total kerb weight of 114 kg. The Vespa RED has been fitted with 90/100 tyres at both ends. The tubeless tyres offer convenience to the rider in case of a puncture. These come mounted over stylish 10-inch satin finished alloy wheels that look stunning. Furthermore, the scooter comes assisted with a 150mm drum brake upfront that pairs to a 140mm drum unit at the rear. The suspension system of the Vespa RED comprises of Aircraft derived single side arm enabled ant-dive feature at the front with Dual-effect hydraulic shock absorber for the rear end. The Piaggio Vespa RED comes with bigger 150mm drum brake upfront along with a 140mm drum brake at the rear that offer an effective braking. The scooter comes with Automatic Headlamp ON (AHO) feature that has become mandatory in India for all two-wheelers starting April, 2017. Under this, the headlight of the vehicle stays always ON in order to enhance its visibility and hence, minimize chances of an accident. The scooter also gets a multi focal headlamp with 35W halogen bulb that offers good illumination at nights.